Thanks to a powerful filtration complex, milk provides a high protection against UVA, UVB, free radicals and prevents skin dryness. Its light, non-greasy and pleasantly scented texture guarantees a renewed pleasure of use with each application. This care guarantees a high security, a great tolerance and a fast penetration. 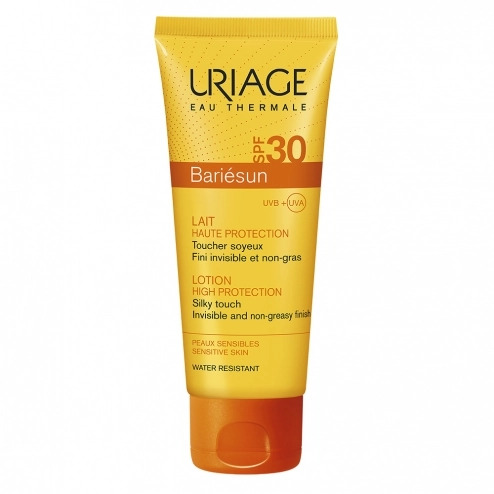 The thermal water of Uriage, in the heart of the Bariésun formulas makes it possible to fight against the harmful effects of the sun. The skin barrier is then reinforced and the DNA is protected from its degradation by UV *. Its new generation of filters filters of last generation ensures a very high protection against the UV. This treatment guarantees a proven photostability and a wide UVB-UVA coverage. Enriched with Aquaspongine and Uriage Thermal Water, milk provides intense protection against drying out. Apply in generous and homogeneous quantities before any exposure to the sun. Renew frequently and routinely after bathing or physical exertion. INCI Formula: Aqua, Dicaprylyl Carbonate, Uriage Thermal Spring Water, Methylene Bis-Benzotriazolyl Tetramethylbutylphenol, Butyl Methoxydibenzoylmethane, Ethylhexyl Triazone, Glycerin, Triacontanyl PVP, Nylon-12, Butylene Glycol, Hydrogenated, Polydecene, Decyl Glucoside, C20-22 Alcohols, Xanthan Gum, Glucose, Perfume (Fragrance), Chlorphenesin, Benzoic Acid, Tetrasodium EDTA, Tocopheryl Acetate, O-Cymen-5-OL, Trehalose, Propylene Glycol, Citric Acid, Sodium Hydroxide, Ascorbyl Tetraisopalmitate.